Sorry about the mix-up yesterday... I'm making some changes in my life! I have decided to start over in blogging. I have been having a problem with readers who feel they need to tell me how to write my blog. They don't like my pictures or they don't like my topics. I'm sorry, but it is my blog and I do not want to be hindered by who thinks what about whatever. I'm also getting a lot of spam that is very annoying. I suppose I could just click on the "only these readers" button. But that would make me and my blog disappear completely for my anonymous readers... I don't think that is fair to the faithful readers who have stopped in for so many months or years. Making a whole new private blog is a bit frightening, but it means I can control things a bit more. I have been playing around on the new blog site (and that's why invitations went out to some people and not to others) and have been having a lot of fun! Hey! I didn't know I could adjust my blog widths if I use another template! I didn't know I could post larger pictures! Oh! So many things to explore! So... It seems that I can just click on a g-mail contact button and everyone will get an invitation to this new blog... But some people (yoo-hoo Leiya, you are one of those people!) have three or four e-mail addresses and I have no idea which one you normally use. What I can do is send out an invitation to people I recognize from their g-mail addresses that I have. I guess if anyone else wants an invite, then you'll have to contact me in this post's comment section or by the e-mail address in my blog profile. This may mean that some people will have to make a g-mail account (which is free) and I apologize if it is an inconvenience or if you feel that I've jilted you. This is the explanation I get on Blogger. You can restrict your blog to only readers you choose. However, these readers will need to log in before reading your blog, adding an extra step. We'll save your readers list for you, so you can switch back at any time. So though I'll be somewhere else and I'll be using a new layout... The new blog is really just a continuation of this one. Same old topics, same animals, same sewing going on. Update. Okay... So far this isn't working. I guess you are going to have to send me an e-mail... I can't register anybody from the comment box. Here it is June. Might as well give a progress report on my patchwork activity at home. Ta-da! 20 Pine Burr Blocks! I am finished with those!!! Whew! I think I was getting sloppy at the end because the last one turned out like a tent and I had to redo it... I don't think you can guess now which one is the sloppy one and I'm not telling! That was A LOT of hand sewing!! And of course I've been plugging away on the lattice strips. I'm still making triangle strips but to alleviate some of the boredom, eh-hem, concentrated routine work, I've been putting the strips together into lattice pieces. At date I have 20 lattice pieces and I think I need 49 (or maybe it is 48... every time I count I come up with a different number.) And I still have about 20 triangle strips (two strips per piece) by my sewing machine so I may have passed my middle mark! Now that my hand sewing is finished on the Pine Burr blocks I will move on to hand piecing the lattice corners. Two done... By my calculations I need 30. Sigh. There are still a lot of sewing days ahead of me but I'm making progress! We had a fun and profitable Thursday Patchwork Day yesterday. Mrs. Furui finished up her Summer quilt for the hospital! I spent the morning sewing down the binding. This turned out to be a collaborative project. Mrs. Furui did the planning and applique (all those freehand stripes and circles!) and I did most of the quilting. 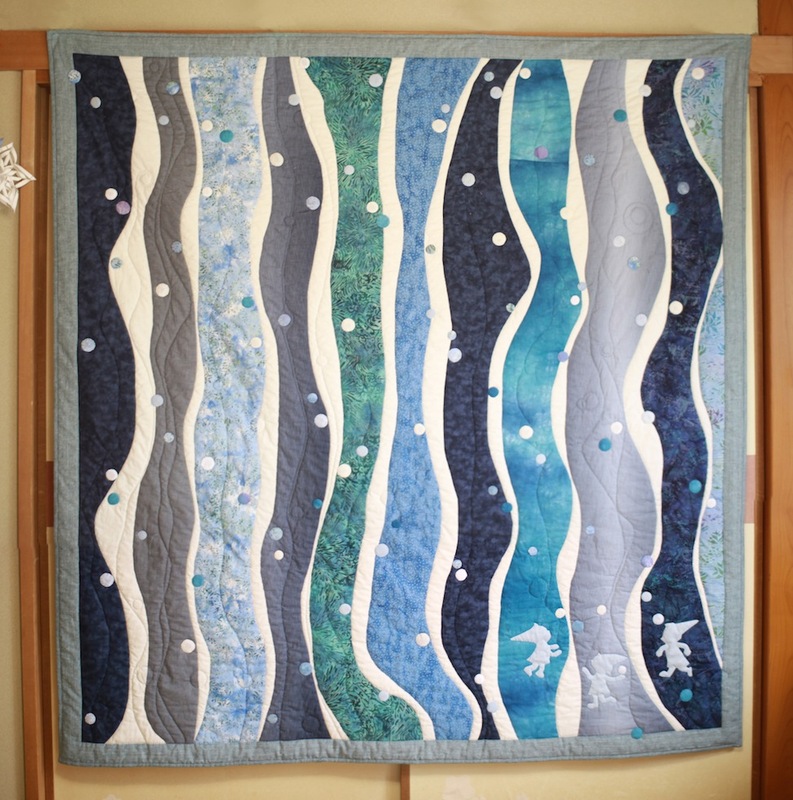 I hand-quilted to my heart's content and probably added a lot more swirls and curves than Mrs. Furui expected. But, it is done! The cute little elves (that we don't want you to miss) are a take off from the hospital wall paper in the children's ward. 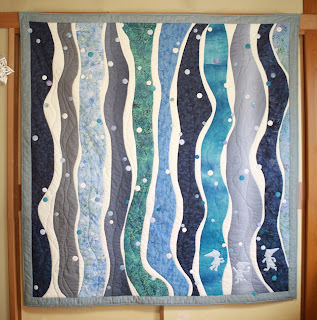 We couldn't think of a good name for this quilt... "Summer Elves"... "Water Play"...? Mrs. Furui will get this up on the hospital wall sometime next week name or no name. Oh dear... We all forgot to take pictures of the bazaar quilt that we basted. I guess everyone was too busy crawling around on the floor with needle and thread. That quilt is officially out of our hands and will go to a friend who will machine quilt it for us. The bazaar isn't until November... We are way ahead of ourselves! Mrs. Yamaguchi spent the day getting her quilt blocks all together into one piece. (Still in the layout stage here but she did sew it all together yesterday). She will add white borders and then trace a quilting pattern on it. Maybe feathers? There were another couple of projects that have made progress... but more about that tomorrow. A typical evening in front of the TV. My sleeping beauties... Neither of them ever have any idea of what we've been watching. A typical shot of Tetsu and Choco in the early morning. Another early morning view of the countryside. Okay... I've got to go. Time to close down my computer and take it to the kindergarten! Today's post is outside my normal range of interests but I wandered through an azalea exhibition yesterday on my way out of the pool facilities. My area of Japan is having all sorts of azalea festivals this week. There were hundreds of azalea "trees" at this exhibition, all pruned and encouraged to grow in many different containers and directions. I suppose this is considered a type of bonsai... miniature tree manipulation. Such a burst of color! And all the potted azaleas looked regal in their honored places positioned on polished wooden diases. Look at the roots on that one! How did someone get that thing to grow? This was my favorite. I was drawn to the asymmetry and balance. Was I inspired to go out and prune my azalea bushes? Nah... I'm not much of a gardener. I'm going back to my sewing. Would you believe it? My camera stopped working yesterday!!! With blood pounding in my head I got out the box that it had been shipped in and checked the warranty. I grabbed box and camera and went to my local camera shop with all sorts of scenerios in my head. In a slightly deranged state I was ready to accost the store manager when a young female clerk got to me first. "Yes. 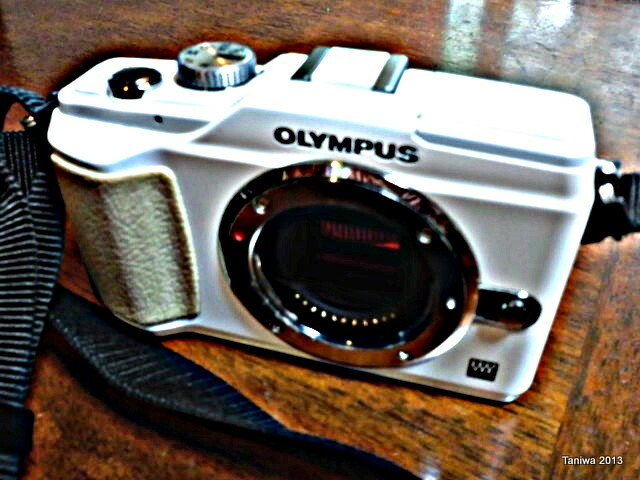 I want to speak with someone who KNOWS cameras." I looked meaningfully towards the store manager. "Yes... Well, I can help you." Hah! This GIRL had white and purple punk hair. She was wearing vibrant green color contact lenses. She had huge Hello Kitty glasses on with no lenses. Her fingernails were an inch long and sparkly black. This punk clerk knows cameras? I explained my camera issue and the girl very deftly manipulated the camera and considered what the problem might be. She jiggled and cleaned and blew at different parts of my camera and finally determined that the lens was malfunctioning... Maybe (oh, I hope!) not the camera. She gave me information on getting an estimate for repairs, or buying a new lens, or replacing the whole kit and kaboodle (NO!!!) The punk clerk was polite and knowledgeable and very helpful. I'm not pleased that I've had to send off my camera lens for an estimate nor that it costs to have it estimated nor that the repair fee will run half the price of the whole camera outfit. But what else can I do? "When you send that lens to the Olympus company make sure they know that the customer (ME!) is extremely dissatisfied with a lens that only lasted a year plus... I am NOT happy!" But I was a little embarrassed at my previous assumption that this punk girl might not know her cameras. "A apologize for my earlier attitude and assuming that you might not know about cameras." "Oh... well... though my appearance may be outlandish I happen to be the assistant manager of the store." Yesterday Tetsu and I attended Takumi's graduation. "What? I'm getting confused. I thought he graduated in February... I thought he lived in California and Tanya lived in Japan." Correct on both points. Takumi received his diploma (smiling picture of him here) in February. He has since found a job and is working in California. But his graduation ceremony was held yesterday in Long Beach. And Tetsu and I attended via the Internet!!!! Such a computer wonder world we live in! Takumi had sent me a link earlier this week saying he hoped we could find him on the big day. Yesterday morning (our time 9:00 Saturday morning, Takumi's time 5:00 Friday afternoon) Tetsu and I settled down in front of my computer and tuned in to Cal State Long Beach University's commencement ceremonies. "I see him! I see Takumi!" In the hundreds of kids graduating, on my somewhat blurry computer screen, I spotted my son. Tetsu and I perched on the edge of the sofa for the next hour listening to speeches (me translating for Tetsu) and then finally watching as the graduate students filed across the ceremony stage when their names were called. "Is that him back there?" But when Takumi got close to the stage Tetsu and I both pointed at the computer screen. From across over 5000 miles of ocean Tetsu and I watched a smiling Takumi cross the university stage, receive his diploma case (he'd received his diploma before) and shake the college president's hand. Tetsu TRIED to take a picture of Takumi on the computer... Not very successful I'm afraid. Consider it pop-art? It is our proof that both Tetsu and I attended Takumi's graduation ceremony. There is a bread shop that I pass on my way to town. I go often enough that everyone knows me and I will buy bread and eat it at the picnic bench outside their shop. For a little bakery there are certainly a lot of different kinds of bread. There are lunch breads with cheese or vegetables or curry and of course sandwiches... How about a fried noodle sandwich? (Hmm. Not my choice either.) There are dessert breads such as custard cream bread, chocolate cream bread and sweet bean paste bread. There are all sorts of cute beads too... Little bears, bunnies, Totoro (a Japanese character) and superheroes. How about some paw print bread? When I visit the bread shop I always get the impression that the baker has a lot of fun thinking up new types of bread. W~o~w! Yes, that is what you think it is... It is named "oppai bread" so now you know the Japanese word for br--sts. It is filled with milk cream. I don't think the owner was being ribald... Oppai bread seems to be a popular bread with the neighborhood children. I love walking into the bread shop! Such an aroma! What shall I have for today's lunch? Have you noticed that I haven't been making very many prayer quilts lately? I have. There are two reasons. One is, thankfully I haven't had many people who "needed" a prayer quilt. The other reason is that I've been having second thoughts about making prayer quilts. Over the past 5 or 6 years I have made many prayer quilts. I even joined the Prayer and Square organization and followed their rules about asking a person if they would appreciate a quilt that has been prayed over. (No prayer quilt surprises!) Some recipients have been church members. Some have been friends. One man was someone I knew in the neighborhood who wasn't Christian and didn't have much hope for his future. Most of the recipients have been returned to health but a few have not. There have been many situations though resulting from the prayer quilts and not all have been good. MOST people when asked if they would like a prayer quilt have received the offer gratefully. But some haven't. One man became upset because he took the offer to mean that people were giving up on him. He left the church angry. My sister-in-law's quilt for her mother got LOST in the prayer chain and that definitely put a strain on Marcy's heart and she has had to pull up an extra supply of forgiveness. And my friend who recently has been in the hospital declined the offer of a prayer quilt saying she would rather not have people focus on HER health but on their own. Ah~~ if this dear friend of mine feels that way... then maybe I have been stepping on people's toes. What it boils down to is that the person in need of prayer (and we all are in need of prayer!) has the correct answer and not I. Tetsu suggested that in some cases my timing might be better... but each person accepts their illness in their own way and in their own time. Which makes me think that I should not be so actively involved in making prayer quilts... this activity which was so close to my heart. I am still going to pray. The elementary school 5th graders had a "Rice Planting Class" this week. Each year the 5th grade class learns how to plant rice and then come autumn they will experience cutting the rice. Finally their harvested rice will be served at a school lunch. Rice planting this year happened on a morning when I was around and I hurried over at the appointed time. The rice field is a narrow one near the road and every year the farmer who owns it prepares it for planting with his tractor, floods it for the children and then conducts a rice planting class. Anyway... the children walked over to the rice field and shed their shoes. The parents who were there to help divided the slats of rice into manageable portions for the children to hold. A string with markers attached had been stretched across the flooded field and the children were lined up along the bank and told to step down into the mud. You should have heard the screams from the girls! It seems that rice field mud is warm and oozy and grabs hold of toes and ankles. Some of the children started floundering amidst a lot of laughter and squelching around. "Help! This feels so weird!" "I'm going to fall over!" "Teacher, the mud is splashing up on my legs!" To which the teacher replied "Then stand still!" Finally the planting began. The farmer instructed the children to pull off two or three stems of rice from the portion they had been given and then the rice was to be pressed down into the mud under the string marker. One girl made the observation, "Why does my nose have to start itching NOW!?" And of course I just laughed along with everybody and aimed my camera. Gradually the hilarity died down and the planting got underway. In a short time the class of 30 some children had a row of rice planted and they were instructed to take a step back and the string marker was moved back a few inches. Then the next row could be planted the same was as the first. A few minutes after the rice planting started, the 1st grade class walked over from the school to watch the fun. I'm afraid I had to leave about then so I only got to see the first two rows planted.